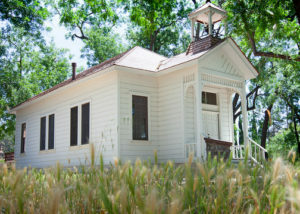 If buildings could talk, the Tassajara School House would tell of children reciting lessons, ciphering and singing in a classic one-room school. 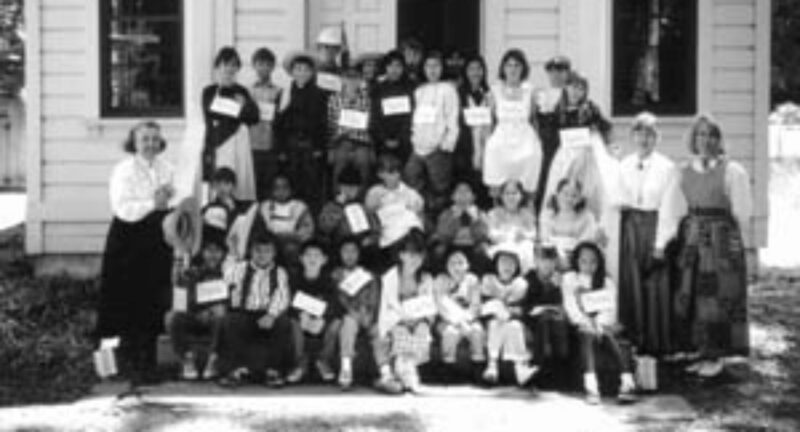 Students from Tassajara Valley ranches attended this school from 1889 to 1946. Today the School House sits in rural, restored splendor on its original site at 1650 Finley Road in Contra Costa County’s Tassajara Valley. A belfry with bell, old outhouses, a restored stable, picnic tables and a new redwood water tower complete the picture. Third graders from Vista Grande School in front of the Tassajara Grammar School in 1999. The School House was the second Tassajara grammar school, built when the student population outgrew a smaller structure. On Jan. 12, 1889, ten out of ten Tassajara School District voters approved the sale of bonds amounting to $1700 to purchase a lot, build and furnish a school. Peter Anderson was paid $200 for an acre of his ranch land on Finley Road. The Livermore Echo Newspaper (March 14, 1889) reported that the contract for the new school was let to J. L. Weilbye of Sunol. In those days, such a small building would have been constructed soon after the contract was signed. Students from first to eighth grade walked, rode horses and took buggies to get to school. In 1889 Richard D. Williams was the teacher and 41 students attended that August. Roger Podva (born in 1884) began school in 1890 and said there were 42-75 students at the school when he attended, sitting two to a desk. They learned mental arithmetic, reading, geography, spelling and writing. A picture of George Washington hung on the wall. According to historian Vivian Coats Edmonston, “Roger Podva said that the black walnut trees in the school yard were planted by the children, starting with the oldest child down to the youngest. That was Roger. His tree was planted by the ‘rest room’.” Students from Portuguese and Danish immigrant families exchanged lunches — linguisa and sweet bread for sandwiches slathered with butter. A public high school in downtown Danville opened in 1910 and some of the students traveled into town for higher education, joining grammar school graduates from Sycamore Valley, San Ramon, Danville and schools. In 1946 Tassajara School enrollment shrank to 11 after two large families moved away. Several parents thought that students could get a better education by going to a more modern school. That year the school closed, and students and teacher Gertrude Arendt went to Danville for elementary school. The desks were transported to Danville as well. Gordon Rasmussen, who was in sixth grade when the school closed, said “It was like hitting you with both barrels. In 1946 I had one other kid in my class, but then all of a sudden the next year there were 40.” (Times, 1972) His younger sister, Nancy, worried about learning all the names in her Danville class, since she had been the only one in her grade. A yellow bus took them into Danville. The abandoned school fell on hard times. The bell disappeared, windows were broken and Washington’s picture was stolen. But people in the Tassajara community organized to restore and care for the School House, replacing the foundation and roof and putting in new wiring and floors. They created the Tassajara-Highland Improvement Association and, in 1970, a new fire district. An annual picnic at the school included a barbecue, raffles, auctions, games and recruitment for fire volunteers. Funds were raised for the restoration. Eventually the picture of Washington was returned anonymously by the youth who took it; in a note he said his conscience had bothered him. Mrs. Arendt donated a World War I Liberty Bell from Pleasanton. Today the School House is in excellent shape because of the efforts of the Tassajara and San Ramon Valley Fire Districts, dedicated volunteers such as Gordon Rasmussen and Vera Reinstein and the supportive Tassajara Valley community. The SRV Fire Protection District, which owned and operated the building until October 2012, installed a flagpole on the original site. A historic plaque was placed by the San Ramon Valley Historical Society in 1999. The school continues to be used for occasional meetings, rentals, tours and picnics. Each spring the popular one-room school program taught by Museum of the San Ramon Valley docent-teachers draws over 3,400 students and parents to the Tassajara School. Since October 2012, the Museum of the San Ramon Valley has owned the School House. For over 100 years the School House has been an important feature of the Tassajara Valley community. It was a school, first and foremost. But it has also been used for graduations, dances, 4-H and fire board meetings, church services, picnics and voting. The picturesque school is a favorite subject of artists and photographers. The restored Tassajara School stands as a tribute to the caring community which worked to save it. Contra Costa County Book of Deeds, April 20, 1889, Vol. 55. Edmondston, Vivian Coats, Tassajara School, 2 pp. monograph, no date. From the Ox Team to the Moon, June 1987. Nilsen, Eleanor, “Little Tassajara School Still ‘Belongs to Area’”, Contra Costa Times, Sept. 27, 1970. Personal communications: Betty Casey, Irma Dotson, Betty Maffei, Gordon Rasmussen, Nancy Rasmussen Ramsey, Vera Reinstein. Reinstein, Vera, To Whom It May Concern, 1 page summarizing Tassajara School history, no date. Swenson, Steve, “Tassajara Valley Youth to Celebrate Old School,” Contra Costa Times, Aug. 30, 1972.